Will Latinos stand strong with or against Wells Fargo? Read below. Latino and Somali immigrants are organizing in Milwaukee, Minn., against Wells Fargo, telling the bank to stop donating to anti-immigrant politicians and investing in private prison corporations while courting immigrant customers. About 150 people, many of them Wells Fargo customers and Latino or Somali immigrants, gathered outside a Wells Fargo branch on Saturday to protest the bank. The protest was part of a larger effort by 84 advocacy groups calling for Wells Fargo to divest its money from companies that profit off of immigrant detention. The protesters called Wells Fargo hypocritical for targeting Latinos and immigrant customers while also giving money to causes that immigrants largely oppose, such as private immigrant detention centers and bills that make it difficult to migrate legally to the United States. 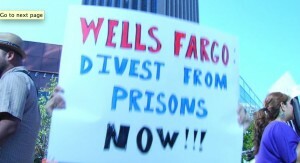 Wells Fargo uses its mutual funds to invest in two of the largest for-profit detention companies: Corrections Corporation of America and the GEO Group, both of which spend millions each year lobbying for stricter immigration enforcement. The two private prison companies, along with a third major company called Management and Training Corporation, profit a combined $5 billion from immigrant detention, according to Brave New Foundation’s “Immigrants for Sale” project. They have acknowledged that a slower pace of immigration enforcement would hurt their bottom line, with Corrections Corporation of America writing in its 2010 annual report that “the relaxation of enforcement efforts” could reduce demand for their services. Both companies have been accused of cutting corners and hiring guards and workers who mistreat immigrant detainees. As of December 2010, Wells Fargo had invested $5.9 million in Corrections Corporation of America and $88.7 million in the GEO Group, In These Times reported in July. Wells Fargo said its critics were misinformed that it invested its own funds in Corrections Corporation of America or the GEO Group, and said that any investments in the companies were made by Wells Fargo mutual funds using money from clients. Wells Fargo launched a new effort in April to gain Latino customers by educating them about banking in 13 cities. The bank also runs Spanish-language ads targeting potential Latino customers. Meanwhile, they have not responded to appeals from immigration advocacy groups to divest their money from the companies, Nammacher said. The Wells Fargo Employee PAC has donated to politicians who have proposed crackdowns on unauthorized immigration, including Rep. Lamar Smith (R-Texas), an advocate of more immigration enforcement, and Rep. Michele Bachmann (R-Minn.). Bachmann has struck a hard-line stance on undocumented immigration during her campaign for the GOP presidential nomination, promising in a Saturday speech to impose stricter border enforcement if she wins the presidency. Of course, not all immigrants oppose increasing border enforcement or deportations, or favor easier paths to citizenship. But among Latinos, 38 percent of whom are immigrants and 19 percent are undocumented, a strong majority oppose crackdowns on unauthorized immigration, according to 2010 estimates from the Pew Hispanic Center. Most Latinos also support paths to citizenship for undocumented immigrants already in the country, according to the Pew report, a move that politicians like Bachmann decry as amnesty. One protester, Ibrahim Nur, said he was especially angry that the Wells Fargo Employee PAC donated money to Rep. John Kline (R-Minn.), who opposes comprehensive immigration reform. Nur became a citizen six years ago, but wants to see changes to the immigration system so he can more easily bring his family over from Somalia. Nur opened an account at Wells Fargo in 2003, and worked there as a security guard from 2006 until earlier this year. But he may take his money elsewhere now that he knows the Wells Fargo Employee PAC donates money to politicians who oppose immigration reform. CORRECTION: An earlier version of this story stated that Wells Fargo is a stockholder in two of the largest for-profit detention companies. It has been corrected to indicate that Wells Fargo uses its mutual funds to invest in the companies. The story has also been updated to include a comment from Wells Fargo.